While there are many ways to select map features using MapGuide, only methods that "select by area" should be used when working with layers that have overlapping map features. Selecting by area rather than selecting one or more individual map features enables MapGuide to drill down through all the overlapping map features, selecting all the map features in the "stack". Setting the Selection Mode to "Intersection"
Regardless of the particular "select by area" method you choose, be certain that your MapGuide Viewer "Selection Mode" is set to "Intersection". Intersection selection mode ensures all map features fully or partially within the specified selection area are selected for reporting. (See Specifyingthe Selection Mode to right-click in the map area, choose Preferences..., pick "Intersection" in the Selection Mode area and pick OK.) If your MapGuide Viewer is set to the default "Centroid" (center point) selection mode, then the center point of each map feature must be within the selection area you specify to select the map feature. "Centroid" selection mode is not a good choice because you will not select some map features that are only partially in your area of interest. 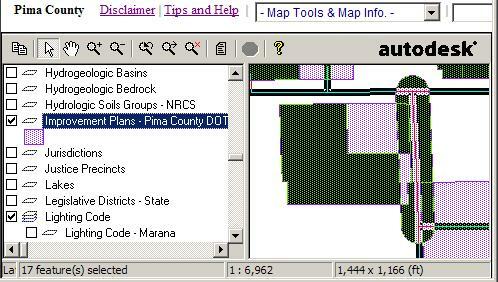 Warning: When selecting by area, it may look like some map features or portions of map features are not selected or are the wrong color when, in fact, they have been selected properly. This is because selecting a map feature inverts its color (i.e. the negative of the color). When map features overlap, there may be two selected map features that both change color, cancelling the inverted color effect. Also, selecting by area inadvertently selects map features on all visible layers, even layers that you aren't interested in, such as layers without overlaps. These selections interfere visually with the desired selections on the layer with overlaps but don't affect reports. The report you choose after selecting the map features only shows entries for the layer(s) the report was designed to support. All other selected map objects from other map layers are ignored. In the sample map above, all map features in the displayed area have been selected. Areas that don't appear to have changed color by being selected actually have two overlapping improvements plans. Both invert their color, cancelling the inverted color effect where they overlap. If there were three overlapping areas, one inverted area's color would not be cancelled and the area would be black. In this example, street centerlines are also selected as a result of selecting all map features within the displayed map area. While the street centerlines are selected they have no affect on the selected improvement plan areas other than changing the map appearance. Where the street centerlines don't overlap the improvement plan area, the selected street centerlines display as bold black lines. Where the street centerlines overlap improvement plan areas, they are yet another color inversion in the stack. For the short selected street segment in the top left, there are three overlaps: The street segment and two improvement plan areas under it. Each of the three overlap colors invert, but the two selected improvment plan overlaps color inversions cancel, leaving the one street segment displayed as selected. You don't need to understand all this, provided you select your area of interest, don't try to judge what's selected by color, and use the report of selected map features (in this case the Improvement Plans report) to identify and learn more about the plans. Zoom in to your area of interest before selecting your map features of interest. This makes the desired map features easier to see and select. Zooming in closer means you won't have to squint or have trouble precisely positioning the mouse. Selecting all map features in a rectangular area. This is the easiest and most common method by far. Selecting all map features in a circular area. One or more existing polygonal map features such as parcels or a subdivision. A temporary polygon you draw with the Select Polygon option in the map right-click menu. See Selecting all map features in a polygonal area. The polygon disappears as soon as the selection is completed. A polygon you draw with the Draw Polygon tool from the "Map Tools & Map Info." drop-down list. This polygon remains on the map for the duration of the session or until you delete it. Selecting features within other map features. Selecting features within a specified distance from other map features using buffers. Individual map features are selected by single-clicking. Holding down the shift key while clicking adds the feature to the set of selected map features. If the feature was already selected, shift-clicking the feature removes the feature from the selected set. Clicking on individual map features selects only the "top" map feature. This is the reason that selecting individual map features should not be used to select map features to report for layers with overlaps. Selecting individual map features is useful for many purposes, but not this one!